State Minister for Foreign Affairs M Shahriar Alam on Monday said South Korea has turned out to be an important development partner of Bangladesh and sought the expansion of activities under the Korean Economic Development Cooperation Fund (EDCF). The State Minister made the remarks when South Korean Ambassador Hu Kang-il met him at his office at the Ministry of Foreign Affairs. The South Korean Ambassador highly praised the technical skill of young professionals in Bangladesh who are presently working in assembly plant and research centre of South Korea’s electronic giant Samsung. Shahriar recalled the pioneering role of South Korean companies to develop textile and garment industries in Bangladesh. He said Korean success in transforming South Korea within a generation has inspired Bangladesh to steer the nation on a development path. 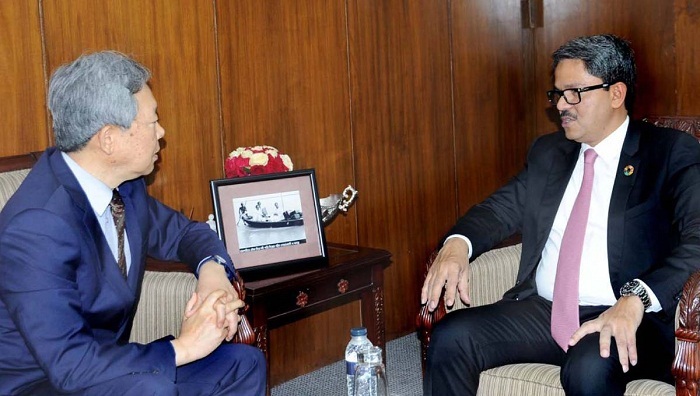 Ambassador Hu Kang-il praised rapid industrialisation and development of Bangladesh under the able leadership of Prime Minister Sheikh Hasina, which gives a bright future of Bangladesh, according to the MoFA. While mentioning Employment Permit System (EPS) of South Korea as a model in recruitment for foreign workers, Shahriar requested the Ambassador to increase the intake of Bangladesh nationals for recruitment under EPS.